Rabbi at Cairo in the sixteenth century. He was a contemporary of Joseph Caro, whom he severely criticized on account of a Halakah. Lived during the seventeenth century. He is eulogistically mentioned in the responsa of Meïr Boton. Portrait-painter; lived at Venice in the fifteenth and sixteenth centuries. He is highly praised by David Reubeni in his memoirs for having befriended the latter on his arrival in Venice from Arabia in 1524. Moses' reputation as an artist extended far beyond the limits of the ghetto of Venice; indeed, he was known throughout Italy. In 1521, in recognition of his great talent, the Council of Venice granted him the privilege of selling his artistic illustrations of the Pentateuch. Son of Simeon (No. 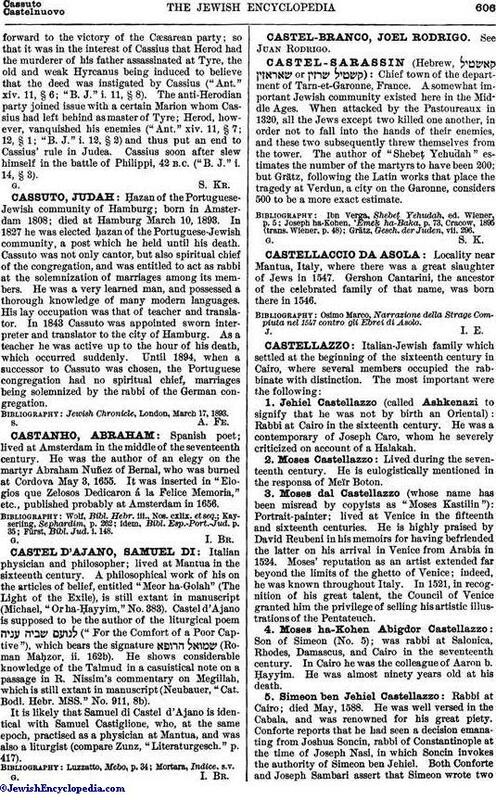 5); was rabbi at Salonica, Rhodes, Damascus, and Cairo in the seventeenth century. In Cairo he was the colleague of Aaron b. Ḥayyim. He was almost ninety years old at his death. 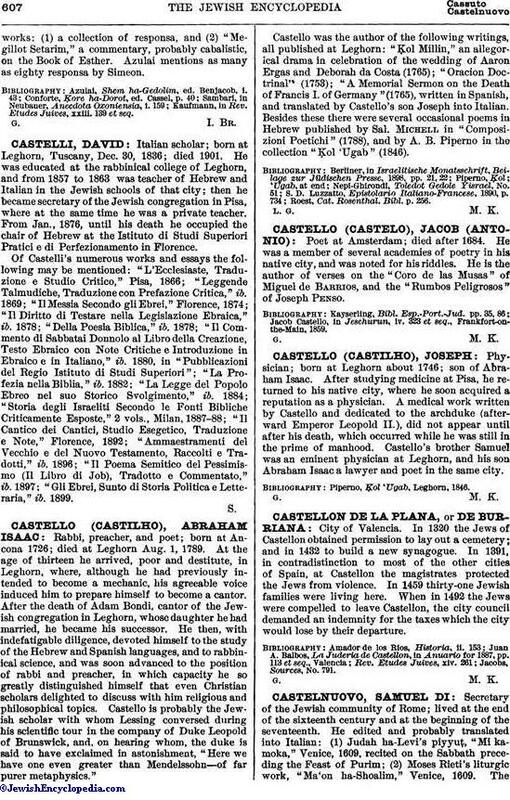 Rabbi at Cairo; died May, 1588. He was well versed in the Cabala, and was renowned for his great piety. Conforte reports that he had seen a decision emanating from Joshua Soncin, rabbi of Constantinople at the time of Joseph Nasi, in which Soncin invokes the authority of Simeon ben Jehiel. Both Conforte and Joseph Sambari assert that Simeon wrote twoworks: (1) a collection of responsa, and (2) "Megillot Setarim," a commentary, probably cabalistic, on the Book of Esther. Azulai mentions as many as eighty responsa by Simeon. Kaufmann, in Rev. Etudes Juives, xxiii. 139 et seq.